The Orange & Coco Pacifier clip is the perfect accessory! Convenient for parents and amusing for children! It's a creative and personal gift that can be kept in baby's keepsakes. They are made in Canada by hand and with love. To make there pacifer clips, I use wooden beads of the highest quality from Germany, wich are colored with non-toxic and lead free paint designed especially for your littles ones. The pacifier clip is attached with an ultra durable polyester cord. 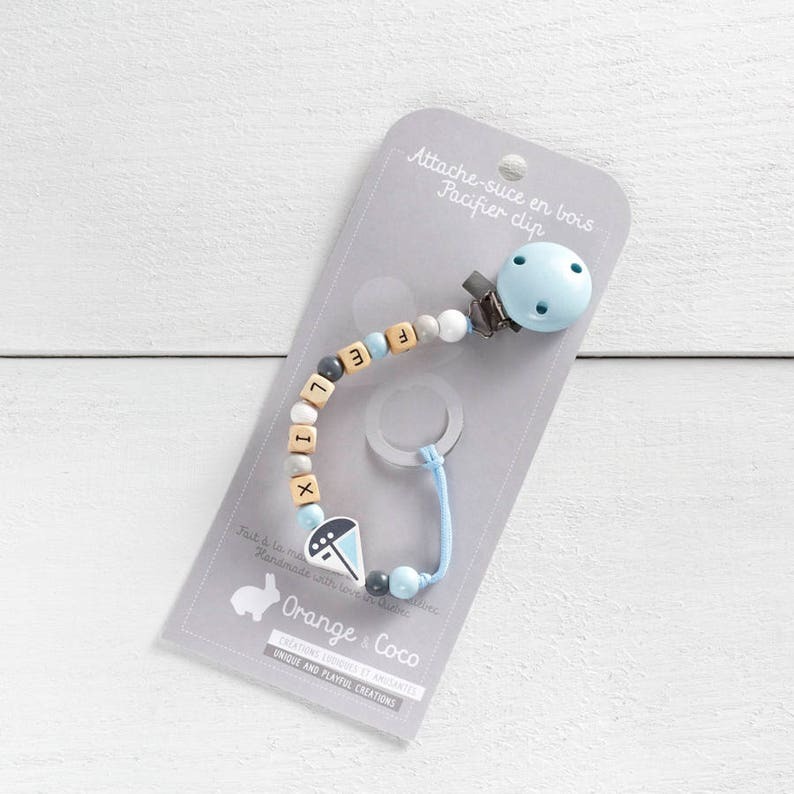 Just attach the pacifier clip to your baby's clothing so their precious pacifier is always close-by. Ours pacifier clips meet the safety standards for children's products. Please note the placement of the beads may vary depending on the child's name and availability. If you have requests, please note them in the "message to vendor" section. Remember to note the child's first name in the "message to the vendor" section. If your purchase is a gift that will be sent directly to the happy recipient, I will gladly gift wrap your order and include a personalized message free of charge. Please note this in the "Message to vendor" section. All our products are manufactured in a smoke-free environment. WARNING! Before each use check carefully your pacifier holder before use it. Throw away at first sign of damage or weakness. Never lenghten the soother holder. Never attached to cords, ribbons, laces or loose parts of clothing. 1- Make sure the clip is securely fixed to the clothing. 2- The clip should only be fixed to clothing. 3- Only use the pacifier holder outside playpens, beds or craddles. 4- Use a damp cloth for cleaning. 5- Do not use cleaning or sterilizing agents. 6- Store when completely dry. 7- Do not affix holder to heavy objects. 8- Don't use this pacifier chain as a toy. 9- If the pacifier clip is exposed to excessive moisture such as saliva and water, it is possible that the color fades with time. This effect of uses is not a risk for the health of your child. The paint used is lead free and non-toxic. 10- Never leave your children unsupervised when he is using the pacifier holder. very unique. well crafted. true to photo. shipping was as expected. good communication. Super cute. Well stitched and smells wonderful. Payments can be made through Paypal. We would appreciate payment within 48 hours of your order. No orders are shipped before payment has been received. All returns and exchanges must be arranged within seven days of reception of your order. Items must be returned in their original box and undamaged. After reception, I will refund you or send you a new item as our arrangement. All our products are sent through Canada Post.